This picture is a reproduction of an ancient Roman rock mosaic. The technique is called Pietra dura. The original is currently on display in an Italian museum. They say when you walk in another man's shoes you gain a better understanding of that person. As I worked on this reproduction, I learned a lot about the artist and his artistic creation. The workmanship shows the ability to cut curves in stone so precisely that the seams need no mortar. When comparing the style of the tiger to that of the calf, the tiger has seams of contrasting stones creating muscle tone and curvatures where the calf is plain and void of color and pattern. The tiger is featured as a tigress and the calf has no gender. 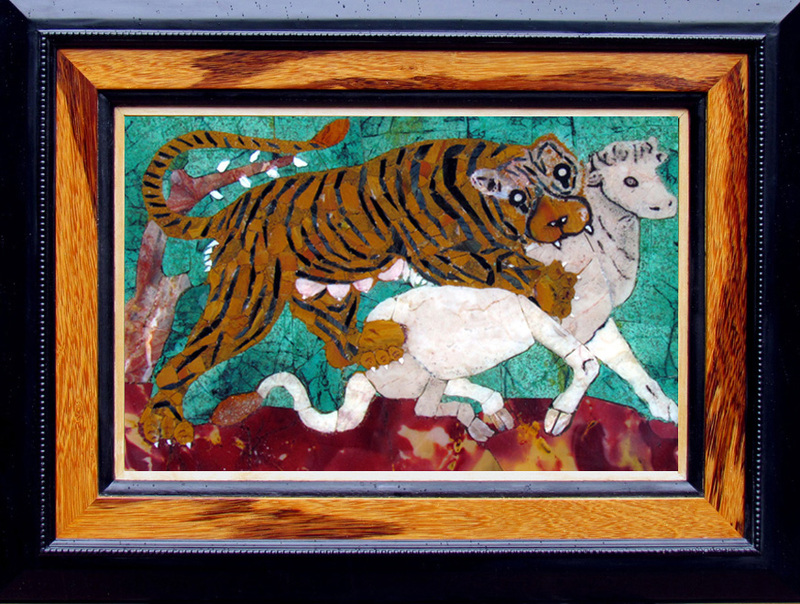 I do not know why the artist's portrayal of the tiger and the calf are styled so differently but the contrast is there. In reproducing this picture, I did not use the same type of rocks; therefore, the colors and patterns in the stone vary somewhat.